Last nite, I made this strawberry jellyhearts cheesecake. I got the idea from Yochana's Cake Delight. However, I didn't follow her recipe, instead I used the biscuit base and cream cheese filling recipe from the no-bake oreo cheesecake I made earlier. Furthermore, the original version is suppose to be in squares but I made it into a round shape, just like a cheesecake. Initially, I thought it should be quite simple...just follow the same method as the oreo cheesecake and then top it up with jelly. I was wrong, I made 2 mistakes while making this cake! Mistake no. 1: I didn't add the strawberries before putting the cake into the fridge to set the cheese mixture. I made the cream cheese mixture just before dinner, thinking that I could cut the strawberries and layer it after dinner. However, the cheese mixture was harden by the time I was ready to add in the strawberries. So, they couldn't "stick" onto the cheese layer. Well, I thought, it should be alright, since the jelly would cover them up and set them "down". Little did I know that when I pour in the jelly, the strawberries started to "swim" in the jelly liquid! So I tried to "pin' them down by pushing them into the cheese mixture. To my horror, tiny bits of cheese mixture came floating on the jelly liquid. That's mistake no. 2. Mistake no. 2: I didn't wait long enough for the cheese mixture to set. You see, I thought since the strawberries couldn't stick onto the cheese layer, the cheese mixture must be very well set right? I was wrong, I believe it was because the mixture was not well set, as such, tiny bits of cheese started to dissolve when the the jelly was added. My recovery actions were to spoon out most of the jelly liquid and put the cake in the freezer to freeze it. After half-an-hour, the strawberries were set with the help of the thin layer of jelly. I poured in the remaining jelly and let the cake set overnight. It was tedious to carefully spoon out the tiny bits of cream cheese. Luckily, the cake turn out quite ok. So, if you want to try this out, do take note of these 2 steps. 1. 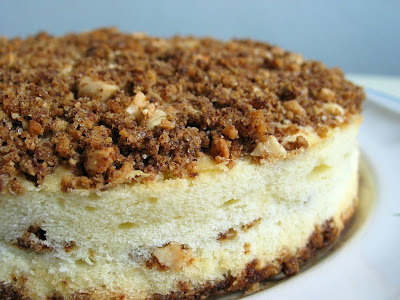 Mix biscuit crumbs & melted butter together and press firmly with the help of a spoon onto the base of a 18cm cake tin. Chill for 30 minutes. I'm wondering if you use a cake tin, do you line with cling wrap or how do we remove the "cake" after it is set? Elyn, yes I used a cake tin (not the loose bottom type). I simply line the cake tin with alum foil. Once the cake is set, I lifted it out from the cake tin with the alum foil...then tear alway the foil. The sides may not be very smooth if you use a round tin. I suggest you use a square tin for Jellyhearts...they look much nicer in squares, and the sides will be smoother...as the alum foil will not be so crumbly on the sides. Thanks so much! I just did your recipe in a 9" X 9" tin but found that the biscuit base is a bit too thick, is it suppose to be dry and crunchy? Wat happen was I line it with cling wrap and had a little mishap, the jelly went out of the clingwrap! Nevertheless, it's very delicious! Elyn, so you tried with the gelatin you bought? I just used the normal gelatin I bought in a small plastic bottle form. Not sure whether there is any difference? Oh yes, I finally try the gelatin but ain't sure the difference between the fished and cow base but I did hear that the there is a significant taste to the cow base gelatin. Hi, I was wondering if it was possible to beat the cream cheese without using an electric mixer, but by hand. Hi Sophia, although I have not tried it with a manual whisk, I think there shouldn't be a problem. Just remember to soften the cream cheese in room temperature before you start. It will be much easier to whisk it. Very happy to chance upon this recipe. may i ask, from ur recipe, there isn't whipped cream stated in e ingredient. I've other version of recipe on this jelly hearts which does require whip cream. Just wonder if it taste any diff? I see that your heart jellies are beautifully sliced. Please share how you do it. Thks for the speedy responds. TQ for sharing this recipe.I made this today and just had a slice....very yumz.I used a bottomless 7" by 7" square tin,wrapped cling wrap tightly at the bottom. I tried making it yesterday.. It was very nice.. however, the jelly did not stick to the cheeze.. it was detached. It came off. =X any idea why?? Hi Anne, I suspect, you may have poured the jelly a little too late...the cheese layer could have already fully set? as such, the jelly didnt stick on to the cheese layer. Hope this explains why. ok, i found my mistake..
"Chill for at least 3 to 4 hours"
Hi, happen to view your blog and your Strawberry Jellyhearts Cheesecake look very nice. =) I would like to know vanilla extract and vanilla essence is there any different? Hi Anonymous, thanks for visiting! Vanilla extract is produced by stepping vanilla beans in an alcohol and water solution for several months. Vanilla essences are two fold or three fold extracts, which is very strong and mainly use by professional bakers. Home bakers usually use vanilla extract. You may refer to this site for further information (http://www.joyofbaking.com/Vanilla.html). Hope this helps! hi this looks really nice! is there any ways to reduce the amount of cheese used and substitute it with other things? im a non-cheese person but i once tried this cake before and there wasnt really a cheesey taste which i like. i had used cream cheese to make cheese cake before and i find the taste really too strong for me. My friends like it though. thank you so much homebaker! i will try these out this long weekend! im so excited about the whole thing that i kept looking at the receipes over and over again, images in my head. The best part is there's no baking for jellyheart as i dont have a proper oven for baking. Shall update on how it goes.thanks again! i did those strawberry jellyhearts yesterday & the starwberries seem to be floating on the jelly mixture even though i had put the strawberries on top of the cheese mixture before i let it to set. Do make sure your jelly mixture is cool, if it is too warm, it may melt the cheese layer away, as a result the strawberries will float away. I recently read from some blogs that to avoid the strawberries from floating, you may add only a few spoons of jelly mixture, just enough to cover a little bit of the strawberries, let it set for a while before pouring the remaining jelly mixture. Hope this helps. hi Happy homebaker, this is the 2nd time im making this cake and encounter the same problem of cheese layer seeping thru my base. I have freeze the base for abt 2 hrs (went out for lunch) and i let the cheese layer cooled b4 pouring it on top of base... is it normal that it seeps thru the biscuit base? Can you give some advice re this? Thank you! Hi Anonymous, so far I have made several chilled cakes using biscuits as base, I didnt have problem with the filling seeping into the base. Could it be the way u press the biscuits into the pan? You will have to press the biscuits firmly into the pan, it shouldn't be loose. Is that the way you did it? or could it be, you use a bigger pan size and the biscuit base is too thin? Some recipes will get you to bake the biscuit base before using, but I have not tried it. can i use those kind of loose bottom type to make the cheesecake? Hi Xue'er, you can use the loose bottom pan to make this. Hi happy homemaker, i've seen my colleagues ordering this strawberry cherryhearts and happened to chance upon your easy-to-follow receipe, and decided to give it a try over the weekend. What i did was to poke holes at the cheese layer using fork, before pouring the jelly mixture into it, to ensure the jelly is fully 'attached' to the cheese layer. The final outcome is 'great'! Will definitely try again soon. Hi. I had the opportunity to taste the strawberry jellyhearts when my colleague gave me one to try last week. It tasted so good that I just had to look the recipe up online. Thanks to you, I've tried making one today and aside from the thin base (i used a slightly larger square tin - 8.5 x 8.5"), it was delicious. Also managed to avoid having bits of floating cheese and strawberries (thanks for your tips!) and it ended up looking quite pleasing. I've also tried making the horlicks doggie cookies and milo chocolate chip muffins for my family and it was a big hit! but one query. can you advise why my cheese layer is much thinner as compared to yours? I'm using the 10" rectangular tin. Hi SASA, you will need to dissolve the gelatin powder with water to get the gelatin solution, instruction as outlined in step 2. I have tried making the jellyhearts using your recipe, even my husband said it was really nice, love it so much! Thank you so much for sharing! Just one problem i have faced, my base doesn't seem to be too solid which the biscuit crumbs drop off from time to time when eating it, may i know what would be the reason? I have crush the biscuit into crumbs before pouring in the butter which i have melted using low heat at the stove, is this the right way to do it? Or should I pour the butter it before crushing them? I realised that some part of the biscuit crumbs don't get on the butter as we only use 40g butter to 8 piences. I followed the receipe but there seems to be a problem with my gelatin mixture. Is it suppose to be jelly like after dissolving the powder into the water or it is suppose to be watery? Hope you are able to help! Hi Dust, when the gelatine is first dissolved, the mixture should be watery, it will not set into jelly like so quickly. Just my two cents from a baking class, when pouring jelly mixture on the cake, pour it on the strawberry instead of the cheese layer directly. This will somehow minimize the chances of getting cheese mixture into the jelly mixture. Hope this helps. Hey, i was wondering if i should leave the cake in the freezer or the normal fridge compartment to chill? The last time i tried to make a cheesecake it didn't set in the normal fridge compartment though i left it in there for a whole day. But when I left it in the freezer my entire cheesecake solidified. Hi Michelle, you only need to leave this cake in the fridge compartment, not the freezer. You may leave it overnight to make sure that it is fully set. Hi Happy Homebaker, thanks for sharing with us this recipe. I was wondering if it's possible to use light (low fat) cream cheese instead of the normal cream cheese? Would the result/taste differ? Thanks! Hey HHB, one query. Your recipe requires 1 box of jelly. I saw them in different weight at the supermart. Can you please share what is the weight of the box of jelly used by you? Sorry, I have never bake or make anything before. Hence, wanted to know is jelly similar as agar agar? I couldn't find the jelly but instead found those packet of agar agar powder. Can I use those? Appreciate your reply. Hi Anonymous, the jelly crystal is different from agar agar powder. You can look for this brand, Tortally, it is available at most supermarts, see a photo of it here (http://www.flickr.com/photos/frompamm/2621894434/). Hope this helps. Hi Anonymous, I don't know...the texture could be different. I think it is better to stick to jelly. Hi HHB (: Thanks for the great instructions! Planning to make this. But if I can't get a loosebottom pan, can I use parchment/baking paper instead of alum. foil to line the pan? Because I don't have alum foil at home, you see. (: Was just wondering if that would be alright. Hi dottiesunfish, I am afraid, you may not be able to use baking paper...as it will be difficult to line the pan especially if you are using a round pan? alum foil will be much easier to mould it into the pan. Why don't you try lining the pan with baking paper to test it out first. Maybe a square pan will be easier. The other thing is, I am not sure whether the baking paper can withstand the weight of the cake when you try to lift it up. thanks for your great tutorials and patience! I'm going to try your fried bee hoon and simple dishes! hi can you explain" Dissolve the jelly crystal in the cup of boiling water, followed by the cold water"? does it mean to dissolve the jelly crystal in the boiling water and pour the mixture into cold water? thanks so much! hi mummy, i am so tempted to try out this recipe, might swap strawberries with mangoes though, as my hubby loves them. does it work for the no bake cheesecake without gelatine? Because my friend, she's a strict vegetarian and she love cheese cake. but we all know that gelatine are extract from animals. Hi Belinda, the gelatin is necessary to set the cheesecake, without it, it will be in liquid form. I have read that you can subsitute gelatin with agar agar powder, but I have not tried it. Maybe you can try make a Baked Cheesecake instead? What type/ brand of jelly crystal are you using? Hi, I usually use this brand 'Tortally". I followed the directions on the packet, using 250 ml boiling water, 250 ml cold water. But the jelly did not set after two days, it was still quite liquid. What is wrong? Also, is the jelly supposed to stick to the cheese layer? What am I to do for it to stick? Hi Anonymous, I am sorry I didn't know what has gone wrong. If you follow the instructions on the packet, the jelly should set at least when left over night. Maybe you want to try making just the jelly again with another packet? As for the jelly to stick to the cheese layer, I think the timing is quite important, but it is quite tricky. You will need to chill the cheese layer till it is firm and yet not fully set. Spoon a few spoonful of jelly liquid (make sure it is cool before adding) over the cheese layer, if the cheese mixture doesn't dissolve (leaving white bits floating in the jelly liquid) you can continue to add the remaining jelly, otherwise, return it to the fridge and test again after 30mins or so. I'm sorry I can't provide a specific time to chill the cheese layer as the temperature of our fridges may differ. Hope you will find this useful. hi HHB... for the butter... use e normal butter or unsalted butter? Hi Kath, you can use either one. hi happy homebaker, I just did the strawberry cheese cake for my christmas party tomorrow. the cheese taste very good. just that after i pour in the jelly, it leak from my loose bottom pan. Anyway to save from this situation again? Hi Derrick, so far my loose bottom pan doesn't leak, I use it to make tiramisu, mousse cake and even ice cream cake. The pan is just like a chiffon tube pan, without the centre core/tube. Even using it to bake a cake will not cause the batter to leak. Are you using something like this? I got it from Phoon Huat. I read from website that some bakers will cover the bottom of their 'springform' pans with alumn foil before using, maybe you can try this? Or, maybe you can press the biscuit base really hard and freeze it so that the base is very firm and it will not leak? Or, maybe you can check whether your pan is dented? fill it with water to check whether it leaks. Hope these help, and Merry Xmas! Hi. Would it be possible to make the cheesecake without the layer of jelly? Would it still taste good? Perhaps I can replace it with crushed oreo? I wouldn't want a baked cheesecake because I don't have an oven back at home. Hi June, you can make the cheesecake without the jelly, but I don't think it will taste good with oreo. Maybe you want to try another recipe which I have posted under No-Bake Oreo Cheesecake? I tried making this and thanks to this post, I didn't make any fatal mistakes like not waiting for the cheese to firm up before pouring the jello. Just to check, does gelatine solution smells? Yesterday I tried with Aunty Yochana's recipe and didnt know I must add sugar in the cream cheese!! End up the cream cheese taste yucky after adding gelatine solution. What brand of jelly crystal did you use? What happen to the leftover from the cut strawberry? Actually I like your ideal of using a cake tin as I only have a 24cm cake tin! Also, can I check with you what size of cake tins/baking tray do you have or use often? Is it necessary to buy loose base/springform type? If it is, what size should I buy? Sorry for asking so many random questions! Reira, the brand of gelatine I use doesnt have a smell, I use the brand Bake King. For jelly crystal, I use Tortally. Sorry, I don't understand this question: "What happen to the leftover from the cut strawberry?" I only have two round pans, one 20cm (normal pan) and the other 18cm (comes with a removable base). I have a 20cm square pan as well which I use for baking brownies and sometimes bread buns. I use 18cm pan the most as I usually make smaller cakes which is just nice for our family and my small (20L) oven. I am using redman, the ingredient is beef skin. What type of gelatine do you use? I heard from sales person from Phoon huat that there are a few types - different ingredients. Sorry! What I mean by leafover from cut strawberry is after cutting the strawberry into heart shape, there are bound to have some leftover due to the shape being cut out? Thank you so much for letting me know what size of cake pan you have! For the 18cm removable base cake pan, you will still need to grease, lay parcement paper around it? I've yet to try baking cake again. The first so called sponge cake i baked a mth ago, was a rubber due to wrong cake pan used! haha. it was a total disaster. For the square pan, is it one thats around 3" in height? Saw from phoon huat there are square pan thats about 1 - 1.5" in height only. Been wondering what those are for. Lastly, do you always use recipe that calls for 18cm cake pan? or there are times when you need to adjust the amt of ingredient used due to diff cake tin size used? If you did, what method do you use to calculate? Hi Reira, I use the brand Bake King, I am not sure what type of gelatin is that, but it is not smelly. You will still need to grease and line the pan even though it comes with a removable base. Just that you don't need to invert the cake when you unmold. Yes, the square pan I have is around 3" in height. I always follow the recommended pan size. Most of my recipes are either 18cm or 20cm. I try not to adjust the ingredients amount as some of the ingredients cannot be adjusted proportionately. Thanks for your reply & patient in my questions!! Shall head over to shop n save later to see if I can find bake king gelatin. Went to phoon huat on monday but can only find 20cm cake tin! So sad. Will it affect if i use 20cm instead of 18cm even tho the recipe calls for 18cm cake tin? Reira, you can use a 20cm pan to bake a cake that is meant for an 18cm pan. But you will get a 'shorter' cake and you need to monitor the baking time...usually it will bake faster. tried making it but not sure where has gone wrong. I followed all steps closely but by jelly crystal solution sip into the base of the biscuit base. Was my cling wrap too lose ? Or the base is not firm enough ? Hi Serene, Sorry, I am not too sure what you meant? Did the jelly crystal solution seep thru the cream cheese layer all the way down to the biscuit base? or is it only from the side? Did is start to flow over the minute you pour it over the cream cheese? I didn't use a cling wrap, I used an alum foil to line the normal round pan...if you have a removable base pan than you don't need the cling wrap. hi, how do you try to pull the aluminuim out from the base of the cake? the cake is soft, wont the pulling spoil it? i read that we can use cake ring too? but how to? sorry to trouble as i failed to take the cake out nicely ): thank you! Hi Chloe, the biscuit base is quite firm, so you just need to gently push and slide the base out of the foil and onto the serving plate. You can use a cake ring, but I do not have one, so I do not know how to use it. Hi, i'm just curious, how many people does this cake serve? Hi, the cake can be cut into 6 to 8 slices. Hi, yes, you may use disposable alum tray. Do make sure you press the biscuit mixture real hard into the base of the tray. You can also freeze the tray (with the biscuit base) for a couple of hours before using. This way the base will not crumble away easily. Hey hey, the cake turned out yummy! :) I was asking in your "Peach Marshmallow cake" post which jello flavor you were using, went through the thread and found out it was pineapple flavor - thanks! I was wondering if i could use this recipe and use the peach & pineapple jello instead. My family does not really like mousse cake but they love peaches. YES! :) instead of strawberries as decor and strawberry flavored jello, i switch it with peach & pineapple jello. Hi! I'm very interested in making the above cake for a youth event. Am wondering if it can be done in those mini plastic cups so i can serve the masses instead of using the baking tray? Hi Anonymous, I suppose you can use mini plastic cups, I have not tried it, but it will probably take some extra effort and time. The cake looks amazing, and am going to try it sometime soon too! But may i know what kind of tin you use to bake this thing in? Do you use a square one or a round one? And how big is it? Btw, do you know where i can buy square tins in Singapore? Have been trying to look for it at department stores, but no one seems to sell square tins. Hi WeiLi, you can get sqaure tins from Phoon Huat. I have tried making this with both a round tin and a square tin. Both are 8 inches in size. Can I try putting strawberries at the side of the cake? hi, unless you use a smaller pan size, this cake in an 8" pan is quite short, the filling may not be enough to cover the strawberries at the sides. Hi, the cheesecake has to be left in the normal fridge compartment (Not freezer, for ice cubes, ice cream) for it to set. I believe either the problem lies with the gelatin powder...either not enough, or you may not have melted it the correct way. You need to measure out the water, place it in a bowl, then sprinkle the gelatin powder on top. Let it soak for a few minutes. Then double boil the mixture (set the bowl over a pot of simmering water) and let the gelatin dissolve completely. Do not boil the mixture directly over the heat...the gelatin will not work well. Hope this helps. Hi, sorry to trouble you but can you please explain to me what you meant by "Dissolve the jelly crystal in the cup of boiling water, followed by the cold water." Thank you. hi, first place jelly crystal in a big bowl or any heat proof container, then pour the cup of bowling water to dissolve the jelly crystal. Then add in the cup of cold water. Hi there! I was just wondering if I still have to place aluminum foil in a loose bottom tin. Actually, which type is better? The loose bottom or the non loose bottom type? Hi Anonymous, for my loose bottom pan, I do not need to wrap the base with foil (see my latest post on tofu cheesecake). A loose bottom pan is definitely better as it can be used for cheesecake and normal baking. Hi, maybe the cake was not well set, either it was not left long enough in the fridge or it could be due to the gelatin powder. Hi, yes, u can leave the biscuit base over night. Do you cover the mixture with food wrap when chilling in the fridge ? Thanks. Hi. I really like your blog! :) I have a slight problem. Can I know if I can use leaf gelatin? I couldn't find powder form in the supermarket. I tried making this cheesecake last week. It was absolutely delicious but the cheese did not set at all even though I left it in the fridge overnight.I made it based on 40ml of water, so it is only 1/8 of the leaf gelatin which is tiny! 1) Can I chill the cheesecake overnight? 2) How long can the cheesecake lasts? eg: 3days? 7days? 1. yes, best is chilled over night to let the cheesecake set. 2. my own basic rule is, I try to consume any left over food in the fridge within 2 days and not beyond 3 days, 7 days is way too long. Hi! Can I check with you, After you have blend in the gelatin solution into the mixture, how does the mixture look like? Smooth creamy which when u pour it will flow to the crust by itself or have to use a spatular to scoop it to the crust base. Hi Ling, the mixture should be smooth and thick,yet still pourable...ie, if you tilt the mixing bowl, it can still flow down, but it is not thin and runny. hope u know what I mean. Hi Happy Homebaker! Is the melted butter for the base salted or unsalted? Hi Winni, you can use either salted or unsalted butter. I've bookmarked this page for a while and would like to try this soon. I've a 10inch square tin and just wonder if the cake will turn out very short if I were to use this tin? How about double the recipe to bake in a 10 inch tin for a big gathering? Hi Lyn, you can make double portion, maybe you won't need to use up all the amount, you can use smaller pans to use up any leftovers...also make sure the cheese layer is well set before you pour the jelly layer over. I did this cake, but it was not a hit in my family.It looks amazing (though the endings are chipped). The taste is quite bland. The only "good" layer is the upper red gel. The worst is the cream cheese, which does not taste like cheese at all (I used Philadelphia cream cheese). I guess it has to much water(from the gelatine). I used real vanilla essence, without the any success. Maybe I just expected too much from a cake without rich dairy cream, or chocolate, LOL! I LOVE your blogs, recipes! Thank you! I'll do this again, but I'll try to change it's middle layer. I just realized why my cheese layer was tasteless. The gelatin I used asked for both cold and hot water (90 ml in total). After 1-2 h in the fridge, the cheese looked like a very well set white layer. I used 2 circles of halved strawberries. I poured over the super runny jelly. As I used a regular tall pan (no spring-form, mine are too large) I did not care for the jelly being almost like water. In the fridge it was set in 1 h.
I used raspberry jelly as this was the only one I had. I tend to like it more, now after 2 days. It is quite refreshing on these hot days. just want to ask will it be very difficult to remove the tin after when the cake is done? Can you suggest some other combinations other than Strawberry Jelly Hearts Cheesecake that can use the same method? Thank you! Hi Roselind, if you use a springform pan or a pan with a removable base, it will be easy to unmould, just need to slide a knife around the edges to release the cake. I am not sure about the amount to adjust to fit a smaller pan, the main issue is the amount of gelatin to use, and also the amount of biscuit for the base. Hi im a bit rushed for time. If i put the cheese mixture to chill in the freezer instead, would that be ok? Wlf the time taken be shorter, or is it not advised? Hi May i know how big is the cup i need to use for the Jelly? Hi Jane, one cup is 240ml. Hi. Can the gelatin be replace with something else? Or is it necessary to put gelatin? Hi, you can omit the gelatin otherwise the filling will not set. just wanna let you know that I love your site and has bookmarked it! Anyway, any idea if it is possible to use konnyaku jelly instead? Hi Yat, i think the texture will be different if u use konnyaku jelly. was too impatient to wait for your reply and went on to try with konnyaku jelly, and it tasted just as great. Hi, chill the cake 3-4hrs.... cover or uncover the cake? After the jelly, chill overnight cover or uncover? Will it affect the softness of the cake? Hi, you can cover the cake with cling wrap, don't think it will affect the texture even if left uncovered. Hi Happy Homebaker, I am an amateur in baking and knows nuts about cooking. Ever since I knew about your blog, I had tried a few of your cookies and now this yummy cake. Your steps are clear and easy to follow. Now, it can save me to spend $3.80 for 2 small pieces. Thank you very much for sharing your thoughts, recipes. I enjoyed reading your personal sharing too. You have helped me to gain confidence that I can bake too, finally! My kids love this cake I prepared for them. Many thanks!! Keep your blog alive and ongoing for more recipes!! I do not know much about baking and cooking too (^^") just sharing my baking experience with anyone who shares the same interest. I hope you continue to bake and have fun baking with your kids too! Hi, I am not sure as I didn't leave it out for so long. Hi, you can use gelatin sheets instead of powder, but I do not know the exact amount to replace. No, it is not advisable to grease the pan with butter. Thanks for the recipe. I tried it but my cheese part a bit tasteless. .. may I know which brand of cheese cream u used? Hi Eileen, I use Philadelphia cream cheese. Thankyou for sharing this wonderful recipe..i tried it today it turns out really good but the biscuit crust was a little hard i mean it was difficult to cut a bite with a spoon..any idea what was wrong with that? Hi, can I replace icing sugar with fine sugar? It is best to use icing sugar as fine sugar will not melt easily when you mix it with the cream cheese.